It was a great Sunday evening for the U.S. Olympic team, and NBC seemed to benefit from the squad's success. Michael Phelps won his record 19th gold medal by leading the U.S. men's swimming team to gold in the 4x100m freestyle relay. Katie Ledecky captured her first gold medal of Rio, smashing the world record in the women's 400m freestyle. 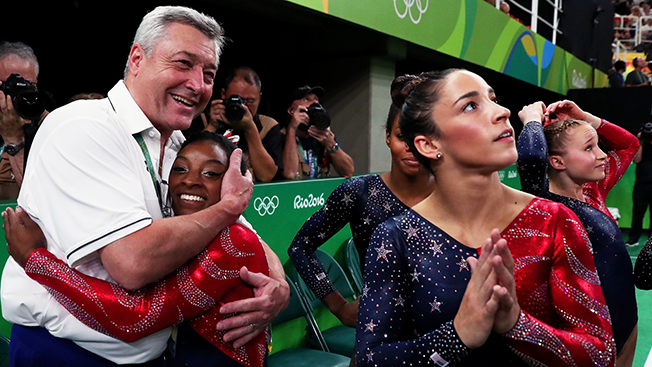 The trio of Simone Biles, Aly Raisman and Gabby Douglas put on a display of dominance in women's gymnastics. Viewers tuned into the Sunday prime-time festivities in droves, as NBC easily lapped the competition. The network posted an 18.6 overnight rating in the daypart, a Rio best and a 2.1-point increase from the opening ceremony, which is the best Friday-Sunday Summer Games increase since Barcelona in 1992. NBC delivered 29.8 million total viewers last night in prime time (7-11 p.m.), up 12 percent from Friday's opening ceremony (26.5 million), but down 15.9 percent from the same night at London, and down 7.6 percent from Beijing. The network also delivered a 9.0 rating in the 18-49 demo, a 21 percent decline from this night at London (11.4) and down from Beijing (11.2). That said, the 9.0 rating in the demo dwarfs all of the other broadcast nets combined. Including NBCSN and Bravo, which also presented live primetime competition, NBC Olympics' television coverage averaged 34.0 million viewers from 8-11 p.m. on Sunday. Salt Lake City was the top local market for a second consecutive night (25.8), followed by Denver (22.3), St. Louis (21.6), Kansas City (21.4) and Phoenix (21.0). Sunday was also the best day ever for NBC Olympics digital platforms, with 231 million live and replay streaming minutes (up 307 percent) from the comparable day in 2012) and 12.2 million unique users (up 24 percent).